This edition of Who Pooped in the Park? follows Michael and Emily on a trip to California’s Yosemite National Park. Michael tries to deal with his fear of bears as Mom and Dad teach him and his sister about the wildlife in the park—without ever getting close enough to be scared. 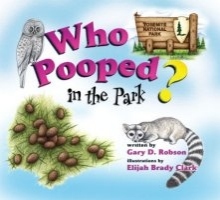 Along with the text and Elijah Brady Clark’s delightful illustrations, the book includes a sampling of “Straight Poop” sidebars, giving kids extra trivia about the animals and their scats and tracks.